With an affinity of a historian who portrays the beauty of our area with oils, acrylics, and watercolors from the softest of hues to the boldest of colors, Robert Tino captures the essence of what speaks to the soul only found in East Tennessee and the Appalachian mountains. His gallery is filled with framed and unframed work that will speak to your heart and adorn your walls with the tranquil beauty of our mountain home. 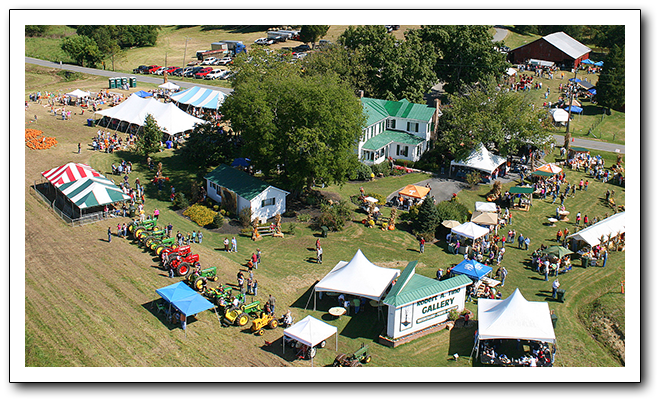 Every October the farm which is home to his art gallery comes to life with a buzz of activity during his annual “Robert A. Tino Smoky Mountain Homecoming.” The fields surrounding the gallery are filled with local arts and craftsmen whose works celebrate our Appalachian heritage. Visitors will find such things as basket making, blacksmithing, wood-turning, bee-keeping, corn grist milling, lye soap making, broom making, hand-made walking sticks and rocking chairs, an antiques area along with antique tractors and engines. There will also be additional crafters with jewelry, pottery, soaps, home décor, fresh flowers from the garden, fall decorations, pumpkins, and more. The air will be filled with the sounds of bluegrass music and the aroma of locally cooked foods including slow cooked bar-b-que, fried potatoes, pinto beans and cornbread, fried green tomatoes, and burgers hot off the grill. Bring the kids for pottery making, art activities, a pick and paint pumpkin patch, old fashion games, and mule pulled wagon rides. One of highlights of the festival each year is an old fashioned church service under the old oak trees on Sunday morning at 9:15. We hope to see you at the Homecoming! October 4th - 6th, 10am - 5pm. The air will be filled with the sounds of bluegrass music and the aroma of locally cooked foods including slow cooked bar-b-que, pork chops on a stick, and burgers hot off the grill. Bring the kids for pottery making, a petting zoo, art activities, a pick and paint pumpkin patch, old fashion games, and mule pulled wagon rides. One of highlights of the festival each year is an old fashioned church service under the old oak trees on Sunday morning at 9:15. We hope to see you at the Homecoming! October 4th - 6th, 10am - 5pm.